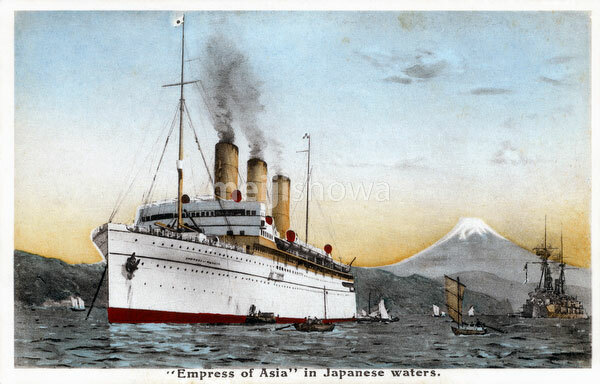 The RMS Empress of Asia in Japanese waters. In the background Mount Fuji can be seen. The ocean liner was completed in 1913 (Taisho 2) by Fairfield Shipbuilding and Engineering at Govan on the Clyde in Scotland for Canadian Pacific Steamships. The passenger liner also served as an armed merchant cruiser and troopship. She was sunk by Japanese aircraft while transiting from Bombay to Singapore during World War II.